Raising public awareness of the Rotary Organisation and Oldmeldrum Rotary Club in particular. Support for National and International Aid projects and Disaster Relief. Developing friendships within and outside the club, and in all the above enjoying ourselves. This project was set up by the Club to commemorate the Centenary of the Rotary Organisation in 2005, and involves the transformation of an area of waste ground in Oldmeldrum into a Garden for the Community. Please feel free to come and visit, sit awhile and enjoy the surroundings. As with any garden, it will always be a work in progress, relying on willing volunteers. Anyone who would like to be involved in any capacity will be more than welcome. On Easter Sunday each year, Oldmeldrum Rotarians and local volunteers hide 1500 wooden eggs around the park for children to find. Other activities through the day include egg-rolling competitions, egg-painting, face painting, and an Easter Bonnet competition. The event aimed this year to raise funds for the STV Appeal 2012, which is helping children and young people in Scotland who are affected by poverty but also allowed participants who choose to be sponsored to give half of the money they raise to the STV Appeal 2012 and half to the charity of their choice. Snow and ice from the previous day added to the festive atmosphere of this year’s Run, though luckily there was enough of a thaw on the Sunday morning to make conditions underfoot not too slippy for running. Although some of the runners enjoyed the competitive element, many of the participants entered solely to enjoy the challenge for themselves, or just to enjoy the atmosphere and the lovely surroundings. For the last five years Oldmeldrum Rotary Club have organised the Ythan Cycle Run whose aim is to raise money for charity, while at the same time providing a good healthy day out for those taking part. 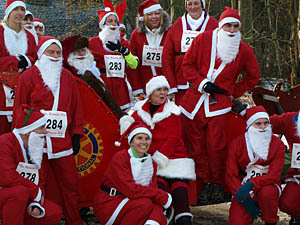 The unique aspect of this event is however that in addition to the main club-designated charities entrants get to chose one of their own to which half of any sponsorship monies they raise will be directed. The event is designed to provide an enjoyable outing for cyclists of all age, capability and fitness levels with 2 routes, a Family Route of approximately 8 miles and few hills, and the Challenge Route of approximately 28 miles, taking in all the hill challenges of the locality. RotaKids is an an offshoot of the Rotary Organisation to enable young people aged 9 - 12 to make a difference to their school, their community, our world. A RotaKids group was formed by Oldmeldrum Rotary in Tarves in 2010, and there are now 16 RotaKids in Tarves Primary School. RotaKids main objective is to introduce Rotary ideals of service to Primary School pupils. Oldmeldrum Rotarians and the school work in partnership with these youngsters, aged 9 to 12, to help them learn the importance of working as a team which makes a difference to their school, their community and their world. RotaKids take a promise: "As a RotaKid, I promise: To be fair to all, To serve my community, To show respect for others"
It boosts young people’s self-esteem and confidence at a key stage when they are psychologically becoming aware of themselves as unique individuals. Projects are decided on by the school but can include Rotary projects. The decisions made always involve the RotaKids. For more information on their activities click here. Oldmeldrum Rotary Club have a strong interest in Art & music and ran an Art & Music Festival for the Community in March 2005, '06 and '07. On Monday 5th October, the Rotary Club of Oldmeldrum and Meldrum Academy’s Performing Arts Department jointly held the annual Young Musician competition for pupils in Primary 1 right up to 6th Secondary in the Assemble Hall. The audience enjoyed the musical evening with tunes from classical preludes and popular melodies. Ray Walker introduced the pupils, seven of whom played the piano, but there was a cello, an oboe, a flute, a guitar, a violin, a viola, a trombone, a baritone and a set of drums. The judges, Justin Brook, Music Service Co-ordinator with Aberdeenshire Council and Dawn Lynch, Depute Rector of Inverurie Academy, both of them expert musicians in their own fields and Justin gave all the performers a verbal feedback which was very positive and encouraging. All 17 contestants received a certificate from President Elect Simon Kilkerr. S4- S6 Christopher Smith from Albyn School who played the oboe. His musical pieces were "Sonato in C Major Movements 1&2" and "Concertino Theme and Variations 1,2 & 3"
We all awaited the final winners who receive a shield for the year and an individual trophy to keep. The Most Promising Young Musician of 2015 was announced as Rhiannon Pirie from Rothienorman who had played "Gospel Oak" and "Samba Reggae" on the drums. The runner up for the Young Musician of 2015 was Ruaraidh Williams who had already won the S1-S3 group. The Young Musician of 2015 was announced as Christopher Smith who lives in Udny Green, and he will go on to the Rotary District 1010 Competition in Perth in February 2016. Rotary Club of Oldmeldrum and Meldrum Academy Young Musician of the Year 2014. The Young Musician of the Year 2014 competition got off to a great start on Monday evening when John McLaughlin entertained the audience by playing Vals on the guitar. John was followed by 17 other young musicians from Oldmeldrum and the surrounding areas. The extent of the young peoples' talents was heard on a range of other instruments including piano, violin and viola, cello, trombone, oboe, cornet and baritone horn. Playing music from classical to ragtime, the young musicians kept the audience of family and friends entertained for well over an hour. The competition which is organised jointly between the Rotary Club of Oldmeldrum and Meldrum Academy Performing Arts Department is now well established as an annual event in the area and welcomes both new competitors and others who have entered in previous years. On the night, Rotarians acknowledged that part of the enjoyment of the evening is seeing how previous entrants had grown in confidence and musical ability. The judges for the evening, Music Instructors Pamela Cook and Douglas Watt had the very difficult challenge of judging, in 4 age categories, as well as for the most promising musician and overall winner. After deliberation the judges announced the winners. From Primary 1 – P4 category John McLaughlin. P5 – P7 winner was Sophie Jackson who played Allegro and Largo on the piano. Sophie from Tarves was also a winner in last year’s competition. The judges acknowledged that judging in the older age categories became much more difficult because of the high standard of playing. In the S1 – S3 category the winner Christopher Smith delighted the audience playing Concerto for Oboe Mvts. 1, 2, 3 & 4. Christopher from Udny was last year's overall winner. The winner of the "Most Promising Young Musician", Ruaraidh Williams was also in this age group, and he was delighted to receive the award for his beautiful rendition of Scherzo which he played on the cello. Last year’s most promising young musician was Jessica Hay, and this year Jessica was judged to be the winner in both the S4 – S6 age group and overall winner of the Young Musician of the Year. Jessica from Pitmedden gave a rousing performance of the Maple Leaf Rag on the piano. Jessica will now go on to represent Oldmeldrum Rotary Club at the District Heat in Perth in Spring next year. The judges were thanked for their time and the effort they made in giving the musicians some very constructive feedback. The evening ended with a well-deserved show of appreciation from the audience who had obviously enjoyed listening to the musical talents of some of our local young people. What a wonderful evening we had in Meldrum Academy listening to the musical talents of our young people! There was music from the violin, the piano, the clarinet, the oboe, the piano, the guitar, the chanter and of course the voice! There were over 20 competitors and all of them performed to an appreciative audience. Jim Walker was the MC for the evening and spoke for everyone when he said what an honour and privilege it is to hear the young talent in our area. This was a joint production between the Rotary Club of Oldmeldrum and the Performing Arts department at Meldrum Academy. Principal Teacher Sheila Robertson was very pleased with the range of ages and the variety of performances. She said to the youngsters from the Primary 5-7 age group “It’s good for you to see and hear the older players, so you can understand what you have to do to reach that level of performance” To the older performers she said, “It’s good for you to watch the younger players and understand how far you have come” To all of them, she encouraged them to practice, practice, practice. The winners were announced in the Primary 5-7 category as Christopher Smith on the oboe, who played Handel’s Concerto No. 1 and the 4th Movement“, Stuart Davidson for the S1-S3 age group, who on the violin played the Road to the Isles, Iron Man and Marquis of Tullybardine, and Stuart’s brother, George won the S4-S6 shield playing his violin with tunes, Cameron Highlanders, Earl Grey and Deveronside. Alistair was particularly pleased that the Rotary Club had a most promising musician trophy as he said “It is particularly good to give praise for potential”. Daniel Osborne of Primary 6 in Meldrum Academy was presented with The Brain Melville Shield for the most promising musician. As the tension mounted Alistair said the overall winner had been a unanimous decision, and he announced to great applause that George Davidson, an S4 pupil at Meldrum Academy, was the Young Musician of the Year 2011 – 2012. President Ray Walker handed over the shield to George saying it was a great pleasure to do so as she had watched him growing in confidence over the last few years in the competition. George was delighted saying "It will be grand to represent Oldmeldrum Rotary Club in the next stage of the competition”. Jack Bagley, an S6 pupil who played the guitar in the competition thanked the Rotary Club and its members for giving pupils the opportunity to display their talents. 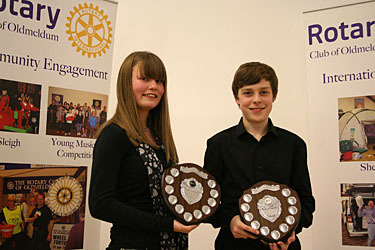 The Rotary District 1010 heat of the national Young Musician of the Year competition took place in St Leonard’s in the Fields Church in Perth on Saturday 25th Feb.2012. There were 11 competitors. George Davidson from Tarves was the representative from the Rotary Club of Oldmeldrum, and he played three Scottish tunes on his fiddle, and for his second part he turned his fiddle to a violin playing Vivaldi and a Canadian Reel. He stood, without any accompanist, using his talented fingers to make everyone’s feet tap! He was wonderful and as the judge said “a master of his genre”. It was disappointing he did not win, however since he had been at another competition that morning and won both his competitions there, he seemed to take the disappointment in his stride. In conjunction with Meldrum Academy the Young Musician of the Year Competition was initially run along with the Art & Music Festival. It is now a stand alone event which has been run each year since 2005. 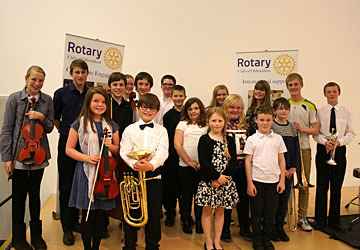 The Rotary Club of Oldmeldrum held its annual 'Young Musician of the Year' contest on the evening of 29 September 2010 at Meldrum Academy. Some 20 entrants ranging in age from 8 to 18 competed for the top prize, which this year was won by 15 year old Meldrum Academy pupil Mikey Kotts. Polish born Mikey - who last year won the competition's 'most promising young musican' accolade, impressed the judges with a confident and polished piano recital of Chopin's Nocturne Opus 9 No 2. "The standard of entries this year was, as ever, excellent, which gave the judges a lot to think about. In the end, though, we have a worthy overall winner in Mikey, who certainly lived up to the 'most promising' title he won last year. He'll be a fantastic musical ambassador for the club, and we all wish him every success for the finals later in the year. "We'd like to thank all the teachers and staff at Meldrum Academy for their support, without which running this contest would be a great deal more difficult. However, we'd particularly like to thank all the contestants for making the contest such a wonderfully entertaining evening, and we hope to see them all back again at next year's contest!" This is a residential care home in Oldmeldrum, and Oldmeldrum Rotary Club give a card and present to each resident on their birthdays. We also plant bulbs, summer annuals and keep the grass of the garden in good condition. Oldmeldrum Rotary organises a "Rotating Books" scheme to promote literacy in the community. Books are left in ‘public places', e.g., hospitals, GP Surgeries, or workplaces, for someone else to read and enjoy, and then leave for someone else to enjoy . Support for Meldrum Academy and its associated Primary Schools. A very successful liaison has been established with the Local Schools from the pre-school children, where the Playgroup were presented with tabards for playing outside, on to the Primary Schools, and through to Meldrum Academy. From this liaison many opportunities are provided by the Oldmeldrum Rotary for the pupils at all stages of their development. RYLA is a week long leadership course for young people aged between 15 and 18. Two camps are run during the first two weeks of the summer holidays – the first week for females, the second for males, at the Abernethy Centre near Nethybridge. Candidates are selected by their local Rotary Club because they have shown leadership qualities which will be developed by an intensive and challenging programme, which includes daily speakers and physical activities and challenges. The Creative Writing Competition has been sponsored by our Rotary Club for 3 years. The theme is chosen each year in negotiation between Rotary and the English department at the Academy. There are 2 categories, junior for S1-S3 and senior for S4- S6. Usually it takes place in the Spring Term (Januray to April), and our club relies heavily on support from the English department, and over the last few years from Kathryn Russell in particular. Kathryn and her colleagues encourage the pupils to enter, and the essays are returned to the Club. For the last 3 years they have been judged by Anne Shirran who each year is excited by the wealth of talent. Once they have been judged the 1st, 2nd and 3rd prize winners receive a book token. Everyone taking part is awarded a certificate and these are presented at the Academy's end of term prize giving, and included in the programme. The theme for 2008-2009 was "Homecoming" to complement the year of Homecoming. In 2007-2008 the theme was the North East. This creative writing aligns well with the Rotary ideals of supporting Literacy and is only one of the ways in which our club sponsors the youth in the community. 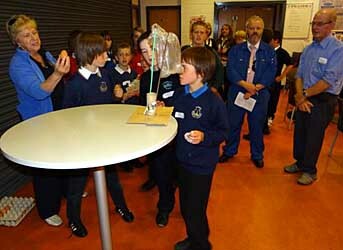 The first of the new format of the Rotary technology challenge took place on Tuesday afternoon the 14th June 2011. It was part of the transition 3 days organised by Meldrum Academy to familiarise the incoming P7 pupils with the Academy layout and syllabus. There were 169 pupils and they were allocated into 9 classes. Each class was looked after by a 5th year mentor. Each class was divided into teams of four and they were briefed on what they had to do which was to make a package capable of holding an egg which dropped from a height of a metre would keep the egg intact. Each pupil was given a paper of instructions. The Rotary emblem was on the sheet. They were at tables and various materials were on hand for them to choose from toilet roll insides, plastic bags, cardboard, crepe paper, kitchen towels, sellotape and of course eggs. They were given hard boiled eggs to practice the fall technique. They took about an hour and all pupils were focussed on their task. Each group effort was judged by their mentor and the winning 9 packages were brought to be judged by Martin Belshaw and Rob Rothnie. All 9 packages were tested by the drop test using, this time, a raw egg, and all passed. However the winning entry had been decorated and well presented as well as fulfilling the drop test. 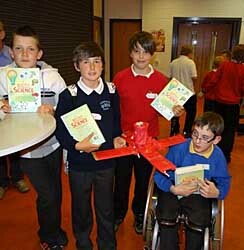 It was good to see the winning team were from different schools and that one of them was a wheelchair user. Ray Walker presented the winning team with Science Dictionaries. All the participants were given a certificate stating that they had taken part in the competition sponsored by the Rotary Club of Oldmeldrum. Thanks are due to the staff of Meldrum Academy especially the Art Design and Technology staff who were keenly encouraging the pupils to experiment. It would seem that this could become the new annual technology challenge. After the presentation Depute Head Dave Martindale explained that as a treat they were to go outside and watch a rocket display. For 30 minutes the pupils were mesmerised by Martin’s rocket display using plastic bottles and air pressure. The first rocket which shot into the air had the audience enraptured. Martin talked throughout explaining what he was doing and giving pressure statistics which the pupils seemed to understand! Five rockets in 30 minutes and 169 pupils keenly engaged with the demonstration. Asked if they had enjoyed the experience - "awesome" was the word most used. 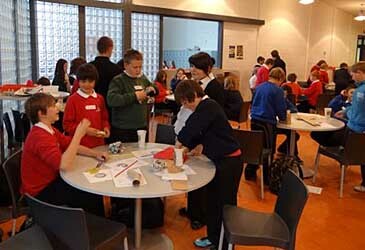 Teams from local Primary Schools are encouraged to develop their technology skills. The event was organised by Ian Jackson, Head of Technical Subjects at Meldrum Academy and was judged by our Rotarian, Martin Belshaw, Systems Manager, of Capelrig, Process Control, Instrumentation & Electrical Engineers, Bridge of Don, Aberdeen and assisted by President Anne and Rotarian Willie Sinclair. There were only 6 schools taking part this year - Meldrum, Rothienorman, Logie Durno, Rayne North, Pitmedden & Old Rayne. It was a difficult job in selecting winners as there was very good work from all the teams. There were six main criteria for marking the construction of the floating oil rig platform, superstructure, one-man vehicle and lifting apparatus viz.- Technical, cost, inovation,aesthetics, quality and effectiveness of display, performance as a team, plus the presentation to the judges. This involved demonstation of the rig meeting technical specification in the test tank and the team being able to "winch" a man (represented by an egg) onto the platform from the sea below. All teams passed this test, albeit some were more expert than others. The 1st Prize of £125 and a Science Dictionary went to Rayne North, 2nd Prize of £75 +SD to Rothienorman and 3rd Prize of £50 +SD to Old Rayne. The Club Heat of the PSQ was held at Meldrum Academy on Thursday evening 8th March, with 9 teams competing from Logie Durno, Meldrum 2 teams, Pitmedden 2 teams, Rayne North, Rothienorman , Tarves and Udny Green schools. The reserves of the above teams were allocated into two further teams. The teams all had an excellent turnout of parent and teacher support. Quiz Master Hilary compiled the questions, and throughout the 10 round competition the audience and teams were kept fully informed by Mick Gordon's computer skills and it was noted the scores were very close. After the final round, Reserve team 1 were the overall winners. However it had been explained at the outset that in the possibility of a reserve team winning the club heat, they could not go forward to the next round. The 2nd and 3rd places Logie Durno and Meldrum A were tied, and a tie breaker round finally allowed the Logie Durno team to go forward to the Area Heat, which will be held at Meldrum Academy on Saturday 19th May. Thanks to the Rotary team of Hilary and Mick Gordon, President Ray and Jim Walker, Sheena and Maurice Clarke, Nicola Harvey, Phil Duncan, Richard Thomson, Rob Rothnie, Simon Kilkerr and to Margaret McCartney and Doreen Sinclair for their assistance in the canteen. Logie Durno team members were Sophie Jamieson, Matthew Law, Rachel Naysmith, and Megan Steele, Meldrum A team members were Finlay Gunn, Kieran Clark, Calum MacDonald and Harry Rintoul. The winning reserve team was presented with shields by President Ray who also presented certificates to all team members. We wish the Logie Durno team every success in the Area finals. 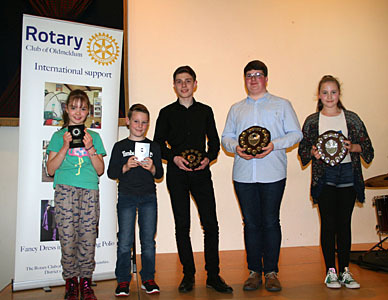 A team of pupils from Tarves Primary School emerged triumphant last Thursday (10 March) in the local qualifying round of the Rotary District 1010 Primary Schools Quiz. 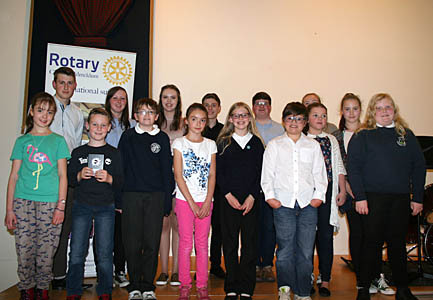 Organised by Oldmeldrum Rotary Club, the contest involved a number of local primary schools compete for the chance to progress to the next round, which sees schools from across the district - from Fife to Skye and all points north - competing for the chance to win the contest. Meldrum Academy hosted the evening under the watchfull eyes of quizmasters Mick and Hilary Gordon from Methlick, which gave pupils the chance to demonstrate their prowess in subjects as diverse as geography, the natural world, pop music and general knowledge. A team of local Rotarians was kept busy with scoring and serving refreshments afterwards to everyone who was there. "We'd like to offer our congratulations to Tarves, and comiserate with the Meldrum 'A' team, who were right up there at the end. Some of the questions were really quite tough - even for the adults present! However, the standard was very high indeed, and all of the teams taking part were a credit to their schools". "The Primary Schools Quiz is one of our favourite events as a club. It's always great to see the pupils enjoying themselves in a friendly competition. We wish Tarves well in the next round, and look forward to hosting next year's event". The Club heat for the Rotary Young Chef competition took place at Meldrum Academy on Monday 21st November. Initially 6 candidates had enrolled to participate, however due to unforeseen circumstances only three participated. They were Aaron Clark, Georgie Ligertwood & Iona McLean. The competition started at 9 am & Peter Walker (General Manager) Meldrum House & Country Club was the competition adjudicator. The competitors had to cook a two course meal for two. The presentation was excellent & the author can vouch for the results which were scrumptious efforts from all chefs. However at the end of the day there can only be one winner & I know Peter had a difficult job in coming to a final conclusion; in the end Georgie Ligertwood from Tarves was the winner of our club heat. Certificates were presented to all participants by President Ray & Peter Walker gave an excellent summary of his assessments for each of the candidate's efforts. Georgie then went forward to the next round of the National competition, which was the District Heat on February 4th at Aberdeen College. Unfortunately, although the judges placed Georgie’s efforts in the highly commended category, she did not progress any further in the competition. The Rotary Young Chef Competition is a RIBI National Competition sponsored by Filippo Berio Olive Oil and consists of 3 preliminary heats with the progressive winners of each of the heats competing in the National Final. This will take place at Chichester High School for Girls in West Sussex on 24th April and will be hosted by Rotary District 1250. The first round of the competition is the club heat which in our case was held at Meldrum Academy on 1st December 2009. The local heat winner was Melissa Kelman, a pupil at Meldrum Academy. Apart from Melissa there were 4 other competitors. The Club heat competition was judged by Cordon Bleu chef Beth Bruce-Gardner owner of the The Friendly Food Company. Melissa's winning menu was main course, Chicken Parma & smoked cheese with carrots, baby potatoes & a leek sauce followed by a Pineapple upsidedown & custard. Each of the participants were given certificates by President Hilary. Having won the Club heat Melissa progressed to the District 1010 North of Scotland Heat which was held at Dundee Technical College on Sunday 7th February. Melissa was competing in a field of 16. Unfortunately Melissa was not able to progress to the Regional Final which will be held at East Kilbride on 13th. March. The winner and runner up of the District heat were from Inverness & Glenrothes. The judge gave Melissa highly commended award & remarked on her skills and hidden talents. The competition aims to encourage young people to: Develop Cookery Skills, Develop food presentation skills, Consider healthy eating options, Prove their organisational & planning skills, and Prove their ability to cope in a demanding situation. Melissa is a 5th year pupil at Meldrum Academy. She hopes to undertake social work when she leaves school, treats her cooking skills as an enjoyable hobby, and very much enjoyed the competition experience. This is a Rotary Event subscribed to by District 1010 and is a weekend programme for S5and S6 students. The objective of Challenge Enterprise is to explore with the candidates the benefits and challenges of enterprise. Oldmeldrum Rotarians support the senior pupils at Meldrum Academy by taking them through a ‘mock’ interview process which gives them an experience of how an interview may be conducted. Rotarians throughout Great Britain and Ireland arrange to fill and transport shoe boxes to third world countries at Christmas and Easter. School children are encouraged to fill a shoebox for children who have very little. In our area we have a very good response from the children and through the years have sent a large of amount of shoeboxes to the scheme. Click on the link for more details of the Rotary Shoebox Scheme. 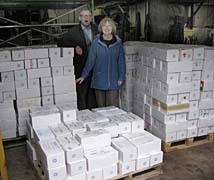 In September 2011, Oldmeldrum Rotary Club picked up from the District Conference in Aberdeen the 350 empty Shoe Boxes that they had ordered, and then, because of demand from the Primary Schools, had to order another 250. Nine out of our 12 Primary schools took shoe boxes this year as well as Meldrum Academy. We gave all the schools a CD explaining the concept, the delivery, and the children receiving them. Maybe that’s why we had 570 Shoe Boxes filled this year by our young people. To download a copy of the ShoeBox Newsletter for March 2012, showing where many of the Shoe Boxes were actually delivered to, click on the link here. Kidout Aberdeen is a fun day out for children with additional support needs, organized by local Rotary Clubs, including Oldmeldrum, and takes place annually at Craibstone on the 2nd Wednesday in June. Pony rides, clowns, bouncy castles and face painting ensure that the day is thoroughly enjoyed by all the youngsters. Do you remember last year Methlick Scouts won the £200 prize and said they would put it towards buying a new marquee? Interestingly the new marquee is ready and we are hiring it for our Haddo Egg Hunt event on Easter Sunday. What one might call a win-win situation. This year we had 26 teams. Many of last year’s teams came along and there were 11 new teams. All had a very enjoyable evening with Hilary & Mick Gordon presenting the six rounds of questions on a large screen ranging from local knowledge to music. Each group was given the chance to say who they were and some of them had specific dates to publicise to the other groups. It was a tight competition and the result was a draw. The winners were the Meldrum Library Reading Group and the Barthol Chapel Primary School Staff. Both teams were delighted with their £100 cheques and have agreed to let us know how the money is spent. Many stayed behind for the refreshments and it would seem they are all keen to take part in 2013. Looks like we may have another annual event! Every June Oldmeldrum Rotarians take a stall at the prestigious event in the Thainstone Mart, Inverurie. It is a great opportunity to promote Rotary and we have a bottle stall, a wheel of fortune, and allow the public to see the friendly face of Rotary whilst collecting money for Rotary and local Charities. Where possible, in all of our activities, we try to ensure that the club members are identifiable as being members of the rotary organisation and create awareness of the objects of rotary. The Club are very proud to have been awarded the 2008 RIBI National PR Trophy. This award is given to the Rotary Club which is judged to have done most to raise awareness of the Rotary Organisation within their local community. Support for International Aid Projects and Disaster Relief. As members of the Rotary International organisation, the Club contributes towards international aid and disaster relief projects, both directly and through the Rotary Foundation Charity, which is a not-for–profit corporation supported solely by voluntary contributions. Its mission is to enable the advancement of world understanding, goodwill, peace through improvement of health, the support for education and the alleviation of poverty. In conjunction with other Rotary Clubs in District 1010, the Rotary Club of Kopundole in Nepal and a Rotary matching grant, the Rotary Club of Oldmeldrum is funding 6 satellite Community Development Centres (CDC) in rural Himalaya, run by the charity First Steps Himalaya. First Steps Himalaya works in partnership with disadvantaged communities in the rural Himalaya to promote early childhood development, community health and awareness. Their aim is to ensure that every child is granted their right to a childhood through long term and sustainable positive behavioural changes. For more details and an overview explaining a bit more about the charity click "First Steps Himalaya - overview" and the web site for First Steps Himalaya. The Rotary Club of Oldmeldrum is delighted to announce that it has recently secured a Rotary Foundation Matching Grant to the value of $41,310 to continue its support and that of Rotary District 1010 (North of Scotland) for First Steps Himalaya in Nepal. Children in Sindhupalchok, one of the poorest areas of one of the poorest countries in the world, Nepal, will benefit from this grant. The money will be spent on improving early learning educational standards, as well as the class room environments in several schools and centres across the district. Classrooms will be transformed from being drab and featureless to much brighter and well-equipped environments for play-based leaning. Local teachers will be given access to training, moving them forward from using basic learn-by-rote techniques to modern more dynamic approaches. This latest grant, is the largest so far secured by the club to help First Steps Himalaya. The Rotary club of Oldmeldrum will rely heavily on its fellow club in Kathmandu Mid-town to help administer the money and monitor the projects and this adds an exciting international dimension to the project. In February, one of our Club members went on a self-funded trip to India to take part in the latest national immunisation programme against Polio. 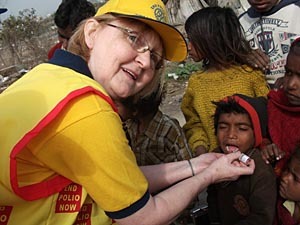 A small group of Rotarians from across the UK, travelled to India, where along with local Rotarians they helped health workers ensure that every child under the age of 5 received the oral vaccine. The success of this on-going programme, known variously as PolioPlus, Thanks for Life and Purple Pinkie, is evident in that during the last year there have been no new cases of polio reported in India. ShelterBox – a tough, green plastic box containing a 10-person tent and ancillary equipment designed to enable a family of up to 10 people survive for at least six months. Local schoolchildren have been learning all about the importance of disaster relief efforts around the world - thanks to a group of Rotarians with a rather unusual set of props. Members of the Rotary Club of Oldmeldrum have been touring schools in the area to demonstrate the club’s very own ‘ShelterBox’, allowing pupils to see at first hand the equipment which can mean the difference between life and death for the survivors of disasters all around the world. The Club recently arranged for the supply of Shelterboxes for the Earthquakes in Japan and Haiti, and the Bangladesh Typhoon Disasters. Since 2005, the Rotary Club of Oldmeldrum has donated funds for the purchase of 30 Shelterboxes, which have been sent out to disaster areas throughout the world. Quiz Nights have been very enjoyable evenings and successful in raising funds for our charities. This event took place at The Melvin Hall, Tarves. A good time was had by all, and just under £1000 was raised for International projects. One successful coffee morning has been organised during the present Rotary year and a further one is planned. The event will be a ‘post Christmas' initiative. (Each member is asked to provide £10 and increase it by using their individual talents). In September, the Club holds a Club Dance, inviting partners and friends to join the members and enjoy an evening of fun and fellowship. The members with partners, family and friends completed the festive season with a visits to the Pantomime in 2008 and 2009. Great fun, and particularly the 3D special effects were enjoyed. We look forward to going again next New Year. When we have a month with 5 Mondays, on the 5th Monday we arrange something different to our normal meeting, and invite our partners to enjoy a social evening. Our Christmas Meeting is celebrated in a different venue to regular meetings and partners are invited along to enjoy the festive celebrations. A rota plan is arranged each year for a member of the Club to host two other members and their partners to a meal, either lunch or dinner. The members being hosted give a sum of money to the Club for charity. This is a very friendly way for the members to get to know each other. The Gavel Competition is a series games evening where Rotary Clubs in District 1010 compete against each other in a knock out, culminating in a final which can have clubs in the semi finals travelling a good distance to enjoy the competition. In 2007, Oldmeldrum Club won through to the the final in Alloa in June. 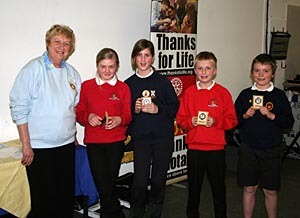 In 2008, we were the winners of the national Gavel Competition at the final in Dunfermline. Since 2004 on a Sunday afternoon in September Oldmeldrum and Ellon Rotary Clubs play cricket at the Methlick Cricket Club. Oldmeldrum won this year for the fourth time. The match was played in full Rotary fellowship and is always a good social event. For the past three years Oldmeldrum have hosted and invited Ellon Rotary Club to join us for a Petanque competition on the courts at Pitmedden Gardens . This is a great evening of fun, friendship and rivalry. We have some enthusiastic members who enjoy curling and are planning to join forces with the Dyce Rotary Club to form a joint team.